We are delighted to announce our Associate and Silver Partnership with The Association of European Vehicle Logistics for 2017. Established in 1997, ECG represents the interests of almost 100 member companies, from family owned SMEs to multi-nationals, and is the major champion of the European vehicle logistics sector. ECG Members provide transport, distribution, storage, preparation and post-production services to manufacturers, importers, car rental companies and vehicle leasing operators in the European Union, Norway, Switzerland, Serbia, the Russian Federation, Ukraine and Turkey and beyond and ProAct International are delighted to be partners of this respected Association. Established as a non-profit making organisation to promote the interests of the car carrier operators, ECG is now the established platform for the automotive logistics sector bringing together logistics service providers, manufacturer logistics managers and suppliers to the sector. Our Chairman, Garth Parker, has just returned from a successful ECG Spring Congress & General Assembly in Malta and we’re looking forward to the ECG Conference 2017 in October. The Conference will be held in Brussels on 19-20th October 2017 and will be looking, in particular, at the increased interest in digitalisation within the industry – a subject very close to our hearts and a particular area of expertise within ProAct. 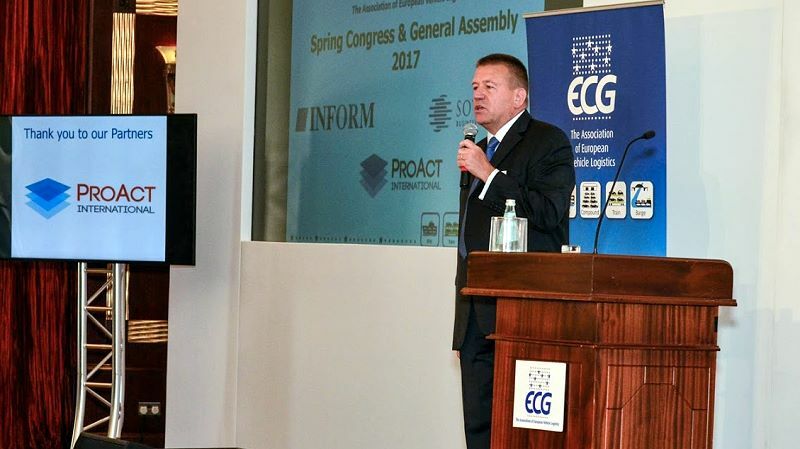 Mike Sturgeon, Executive Director, ECG at the recent Spring Congress & General Assembly in Malta.